Train plants for maximum yields. One DOZEN Grow Systems (your choice of 3 or 6 Gallon Size) plus all the plumbing to connect to your own gravity fed reservoir or direct water source. Comes with a control reservoir that adjusts to different levels for all stages of plant growth. Optimum moisture, nutrients and oxygen delivered continuously throughout all stages of plant growth. Low consumption, low maintenance and low risk! Grow from seed to harvest anywhere indoors and outdoors. Better than recirculating systems! Keeps water cool without power or pumps! For BEST RESULTS plant seeds and clones with Octo Dome Cloner, sold separate. Seventy Two Grow Systems (your choice of 3 or 6 gallon size) plus all the plumbing to connect to your own gravity fed reservoir or direct water source. Auto Fill 72 Way comes with four control reservoirs so growers can adjust the water levels for all stages of plant growth. Optimum moisture, nutrients and oxygen is delivered continuously throughout all stages of plant growth. Octopot Auto Fill Systems are low consumption, low maintenance and low risk! Grow from seed to harvest anywhere indoors and outdoors. Better than recirculating systems! Keeps water cool without power or pumps! For BEST RESULTS plant seeds and clones with Octo Dome Cloner, sold separately. Octopot Auto Fill Systems function with any external water tank, reservoir, rain barrel or direct water source (not included). Auto Fill Systems works on the concept that water finds its own level. All Hydro Reservoirs must be on a level surface or be adjusted in height with blocks or shims to be level. Tubing supplied is enough to do as illustrated or be varied slightly. Check your final spacing to determine your actual needs before cutting tubing. Scale up your garden! Add four more plants to any Octopot Auto Fill Grow System. This is an accessory for the Octopot Auto Fill System. Choose 3 Gallon or 6 Gallon Size to match your Auto Fill System. Control Reservoir is not included. Replacement Gro Sleeves fit both 3 Gallon and 6 Gallon Octopot Grow Systems. 18 + Cases - Contact Us for your Freight Quote. Use the form below and include your shipping address, phone number and number of cases you want to order. Place your order and pay as you go! Get volume discounts, guaranteed prices, and extended delivery terms for up to a year. Determine the total number of Octopot Grow Systems you will need over the next 9 – 12 months. The quantity you choose will determine your price level. Plan your delivery schedule: Provide your approximate delivery/pick up dates with the number of Octopot Grow Systems for each date. Review your sales contract for accuracy. Sign, date and return your sales contract to Sales@Octopot.com or fax to 855/628-6768. Octopot Grow Systems 6 Gallon Size Only. Auto-Fill Systems not included. 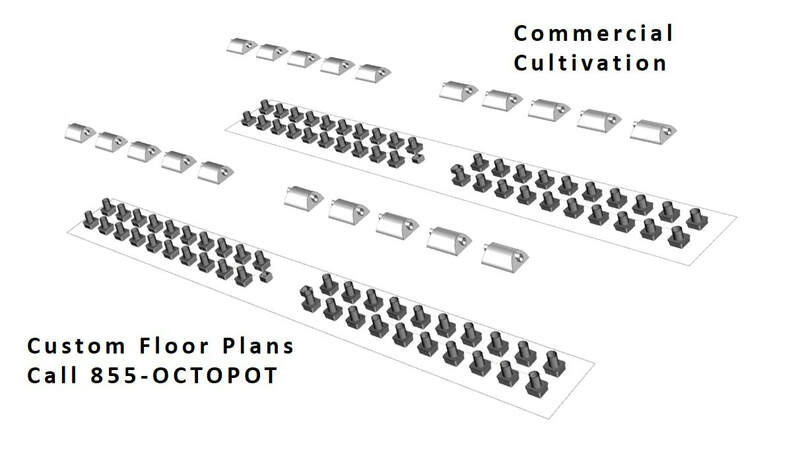 Octopot requires 1/2 of the total sales order as down payment. Deposits are nonrefundable. Balance and applicable sales tax due prior to delivery/pick up of each quantity scheduled. Payment accepted by business check, electronic check, PayPal or major credit card. Checks take 3-5 business days to clear. Lead Time: 4 – 8 week lead time is required for delivery/pickup. Any delivery date changes made to the sales contract are subject to a 4 – 8 week lead time. Any units not received by the customer at the end of the 12 month term on the sales contract will increase in price by $2.00 per unit per 6 month period. Unfulfilled contracts will expire two years from the date of the sales contract. Order will be subject to standard terms and conditions for the sale of goods and limited warranty.